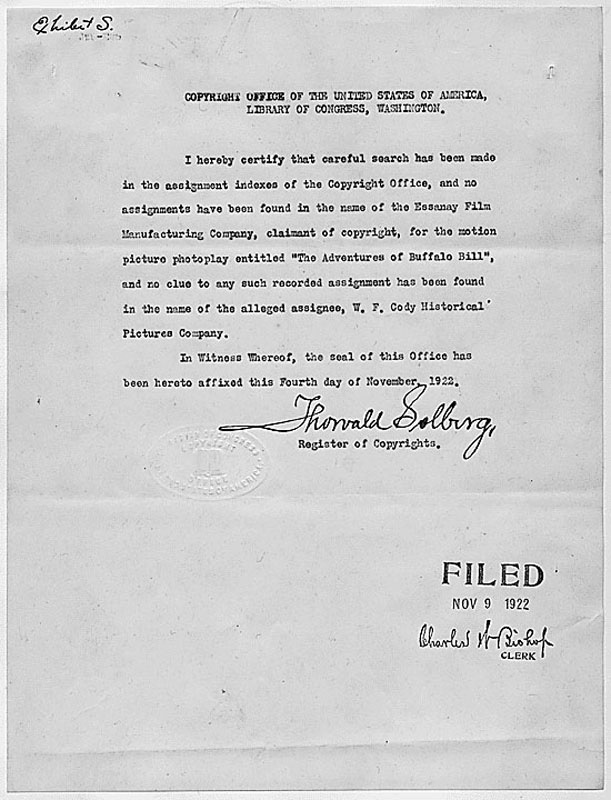 Title: Search of copyright for "The Adventures of Buffalo Bill"
COPYRIGHT OFFICE OF THE UNITED STATES OF AMERICA, LIBRARY OF CONGRESS, WASHINGTON. 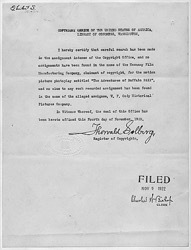 I hereby certify that careful search has been made in the assignment indexes of the Copyright Office, and no assignments have been found in the name of the Essanay Film Manufacturing Company, claimant of copyright, for the motion picture photoplay entitled "The Adventures of Buffalo Bill", and no clue to any such recorded assignment has been found in the name of the alleged assignee, W. F. Cody Historical Pictures Company. In Witness Whereof, the seal of this Office has been hereto affixed this Fourth day of November, 1922.